Mattern Family: For The Love Of Letters! I was so sad one day thinking on the fact that my children may not get to experience this beautiful gift of receiving hand written letters SO I began to plan twice a week to sit down and write people myself. I was amazed at the response! People began returning my letters with expressions of how they too missed this lost art! 1) I made a list of all the people that I could think of that I would like to write. 2) I chose two a day (twice a week) to write. 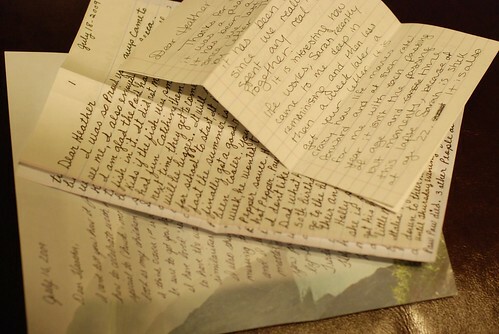 3) I MAILED THE LETTERS! I plan on having the kiddos once a week write letters- to anyone and everyone! Stay tuned to see who they pick to write and the responses that come! This is a great idea! About the only thing I'm good at is thank you cards and of course letters to Rich's non-internet savvy family. I need to be better! I love this idea and the reasons behind it. My daughter writes family who live far away. It's been a really good experience for her. I so miss this too. What a great idea. We are learning cursive because I think it is important to see printing and handwriting as an art.